If you walk south from Saray Hotel, you can cross the street to Rustem?s Bookshop (Rustem Kitabevi), once the largest and best-stocked bookshops in North Cyprus. Forking left immediately after to bookshop, you walk down a narrow street, on the right-hand side of which, after less than 100m, you will see the Buyuk Hammam (Grand Baths), its entrance sunk well below pavement level. This was the level of the street in the 14th century, and the elaborate entrance portal carved in stone is now all that survives of the church of St George of the Latins, the original incarnation of this building before the Ottomans converted it to a Turkish bath. The sunken level means that the carving on the entrance arch presents itself considerately close for inspection of the intriguing mix of Gothic, Italianate and Muslim elements. In 1989 these baths were reopened as functioning establishments, the government having rented the premises to private individuals to run, and they can now be used by locals and tourists alike. 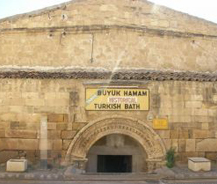 Both men and women are permitted to use the baths throughout the week and women are able to request a masseuse. The minimum time needed for the whole process of heating up the body and allowing it to sweat freely in the hot room is about an hour. Once this stage has been reached you can either give yourself a self-service wash, using the camel-hair glove provided, or prostrate yourself on a stone slab for massage and the removal of several top layers of dirt and skin by the vigorous glove-rubbing of the masseur or masseuse. The baths are open from 07.00 until 22.30. Prices vary from Â£6 (bathing only) to Â£12 (including the exuberant massage), or Â£1.20 if you just want to have a look around. In the large domed room you enter from the street, a huge nail high above floor level marks the height reached by the 1330 flood of the river Pedieos, in which 3,000 people drowned.